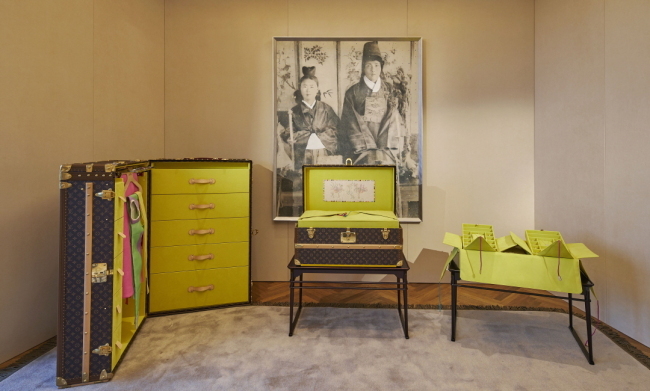 Stylist Seo Young-hee has designed a special edition trunk for Louis Vuitton, influenced by Korea’s traditional marriage culture. Seo, who worked as a stylist for Vogue Korea before switching to work as an artistic director of fashion on a project basis, is known combining Korean traditional crafts with modern fashion. She was inspired by the luxury brand’s “Volez Voguez Voyagez” exhibition in Seoul last year. At the exhibition, one of the brand’s signature trunks was decorated like a “hahm” using objects placed inside and outide it, Seo said. A hahm is a special box containing presents that is traditionally sent to a Korean bride’s house by the groom before the wedding. From last November, she discussed the project with a director from Louis Vuitton’s Special Order Trunk team. After a nearly yearlong project, a Wardrobe Trunk and a Cabinet Trunk were created. It is the first time that Louis Vuitton, known for its bespoke trunks for special occasions, has made a trunk influenced by Korean tradition. The trunks, decorated with traditional Korean fabric and embroidery, carry special ornaments related to the hahm tradition. The cabin size trunk was designed to be lower in height compared to other products, considering that hahm are usually carried on the back. “It was an unforgettable experience to visit a workshop in Asnieres, France and talk about trunk-making with an artisan who worked with respect for and interest in Korean traditional culture,” Seo said. The limited edition hahm trunk can be custom ordered at local Louis Vuitton stores.